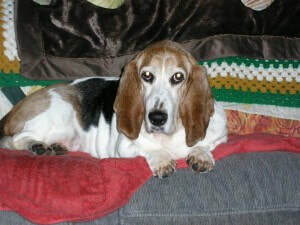 We adopted DJ #9 was on February 10, 2001. He was a lively boy at first, then settled in to be the best basset anybody could want. He shared his home with Sophie and Lucy the Westie, Daisy Mae #632, and when Lucy went to The Bridge, Merrie the Australian Terrier. We did Petco events with regularity, both Greenfield and Germantown, and Petlicious events. He was relatively healthy for all but the last three years of his life. Tumors started to consume him very slowly. On September 25, 2012, he had a good start to the day. Nothing spoiled his appetite, nothing, not even tooth extractions. He had a good dinner. Went outside. Did his thing, then had trouble coming back in. He got back in the house and collapsed, breathing heavily. I called the vet clinic and got an appointment for about two hours later, during which time he continued going downhill. At the vet, she pronounced that he was bleeding out from a ruptured tumor and that surgery was probably not going to succeed. We made the only decision possible, to send him to The Bridge. He went very quickly and peacefully. He was ready. DJ was 12 years old. DJ is still very much missed here at home. He left a big impression on our hearts.